Poor Oddjob, I thought as I read Craig Flichel’s Feature Comparison of Java Job Schedulers featuring Obsidian, Quartz, Cron4j and Spring. Yet again it hasn’t made the grade, it’s been passed over for the scheduling team. Here is Oddjob’s Client GUI, connecting to an instance of Oddjob running as a Windows Service on my home PC. My Oddob instance sends me a reminder email when it’s someone’s birthday, and also tells me when it’s going to rain. The swing UI allows complete configuration of the server. With it I can configure the jobs and their schedules, but unfortunately I can’t control the weather! Ad-hoc job submission is really what Oddjob is all about. Many jobs won’t be scheduled at all and will sit in a folder to be manually run as required. To run a job, scheduled or not, just click ‘run’ from the job menu. Job conflicts aren’t really a problem for Oddjob because it won’t reschedule a job again until it’s finished. If a job’s next slot has passed, you have the choice to run immediately or skip missed runs and reschedule from the current time. If you want concurrent execution you can configure different jobs to run at the same time or use a single schedule and launch the jobs in parallel. Manually Stopping a job is just as easy as running it. Click ‘stop’ from the job menu. You saw this in the first section. Oddjob’s configuration is via a UI and is done in real time. In fact I often start one job as I’m configuring the next. It’s all very interactive. Oddjob uses XML behind the scenes for those that like to see under the hood. It’s very easy to trigger a job based on the completion state of another job. You would have to write code to listen to configuration changes though. There’s lots of options for job chaining, sequential, parallel, or cascade, and any nested combinations thereof. Adding a custom Stateful listener would be easy enough, and might be useful if embedding Oddjob but this isn’t the normal use case. The unit tests do this extensively however. The same UI allows you to see the job state, job by job log messages, the console of an Exec Job, and the run time properties of all the jobs. Oddjob has a Grab Job so you can run the same configuration on several servers and have them compete for work. I wrote it as a proof of concept but I’ve never had cause to use it in the field and I haven’t had any reports that others have either. In the same way that you add the ‘Grab job’ to many servers to share work, you could in theory just add Grab for a particular job to only certain servers. I guess this is server Affinity? In theory Oddjob can schedule with millisecond precision, but this isn’t usual practice. Polling for a file every 30 seconds, for instance, is normally fine. No REST API. You can embed the JMX Client easily enough and control everything from Java, but not for other languages. Not yet. Oddjob has the concept of breaking a schedule with another. The breaks can be as flexible as the job schedule itself – define days, weeks or just a few hours off for a task. 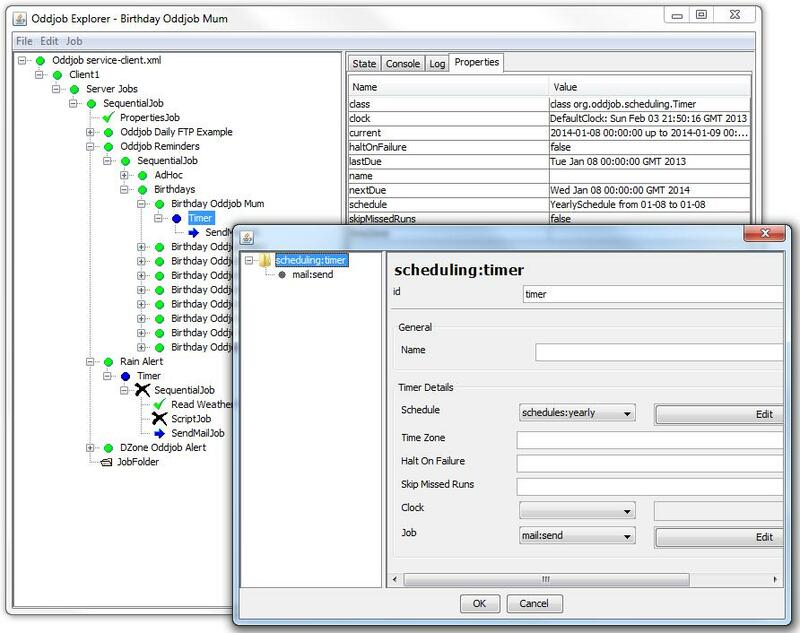 The Scheduling section of the User Guide has much more on Oddjob’s flexible scheduling capabilities. Oddjob has many other features to make automating repetitive tasks easy. One noteworthy feature is the ease of adding custom jobs by just implementing java.lang.Runnable. Oddjob is undeniably an amateur player in the Scheduler league, and one that is often overlooked. With its Apache licence it is completely free and open. Why not check it out when you have an hour or two? You might be pleasantly surprised by the quality of play. This entry was posted in Oddjob and tagged oddjob, scheduling by rob. Bookmark the permalink.